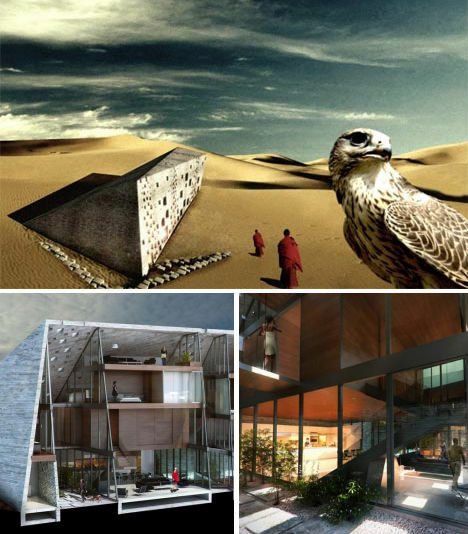 Once built purely for practicality in the face of some of the world’s most extreme climactic conditions, desert architecture has evolved into a modern art form, not just in stunning rammed-earth-meets-glass-and-steel visuals but in cutting edge energy efficiency. 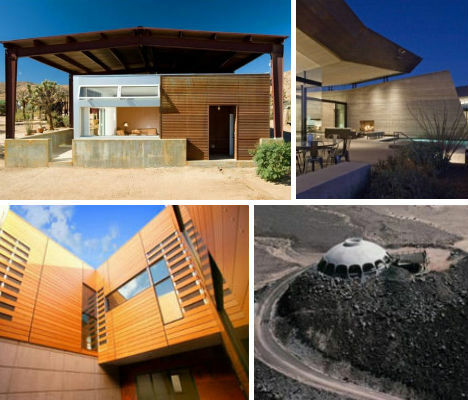 These 12 modern desert homes stand out for innovative passive cooling systems, dynamic shapes and often a sense of minimalism that reflects the simplicity of the sand that surrounds them. 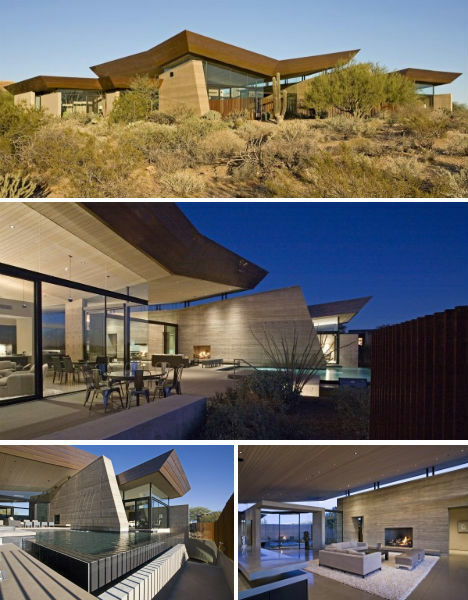 From a distance, at a certain angle, architect Rick Joy’s desert creation looks like any other low-lying home. But up close, the home is revealed to be a hidden hideaway, set into the ground. Made with rammed earth, concrete and a rusted core-ten steel roof, this home offers minimalist multi-level living that takes advantage of cooler air closer to the surface of the landscape. This genius idea for an energy-saving home uses a metal canopy over the roof to encourage air flow, eliminating the need for air conditioning. 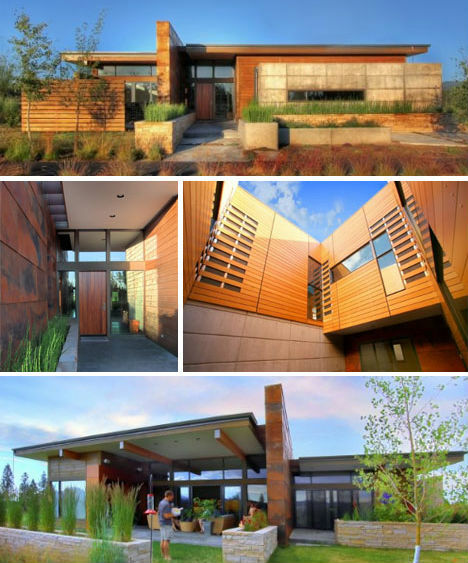 Architect Lloyd Russell used recycled and reclaimed materials in this shaded design, which also has full-height sliding walls and windows to engage the wild natural surroundings rather than shutting them out, as is so common in hot climates. Rustic and unassuming outside, this modular home concept designed by Ordos for nomads living in the harsh desert environments of Inner Mongolia has a roomy, modern interior. Ordos imagines the inhabitants of this unusual building living a modern version of the nomadic lifestyle via transportation and information, residing within a protective shell that shelters them from the extremes of both winter and summer weather. 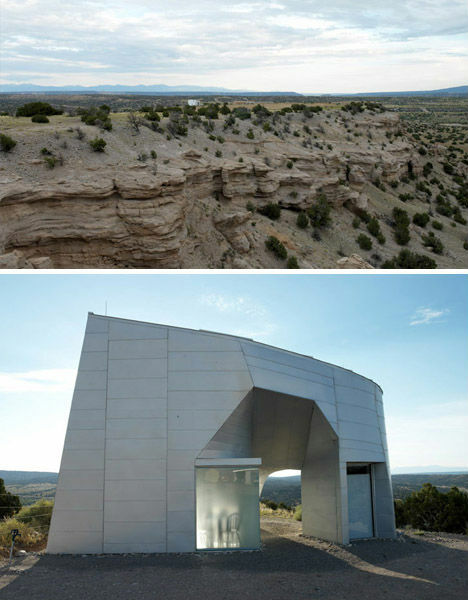 Looking nearly as solid as the mesa upon which it stands, this stunning metal-clad home by architect Steven Holl was “imagined as the tip of an iceberg with a much larger mass below”. Though it does not actually extend underground, it looks as if it could, seemingly rooted in the sand. The home was constructed off-site using 3D digital modeling and prefabrication techniques. 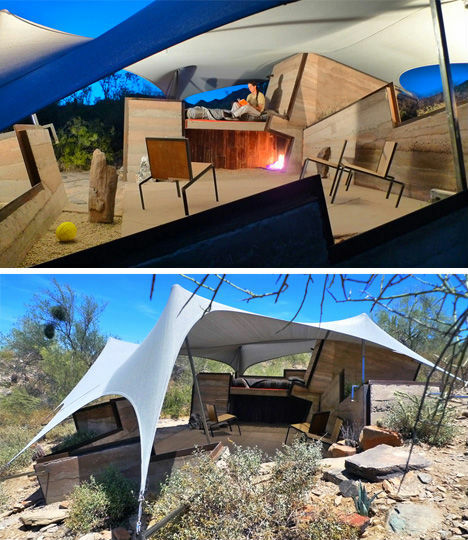 Constructed almost entirely of scrap, waste and local materials, this open-air home designed by Simon de Aguero for the Frank Lloyd Wright School of Architecture features a core structure made of rammed earth and a stretched vinyl shade acting as a roof. 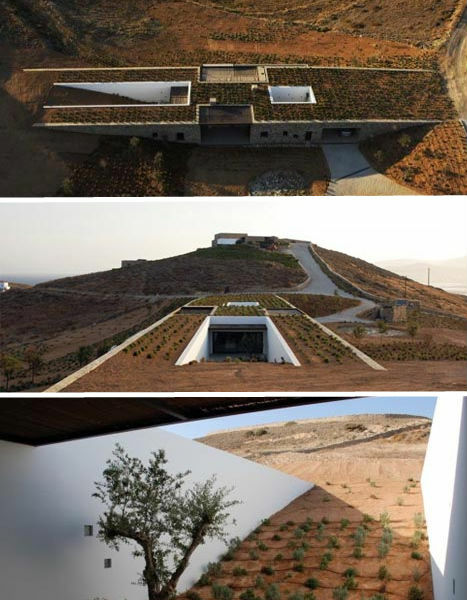 Barely visible above the bluffs in the arid desert climate of rural Greece, this rectangular underground home nestled in the valley between two hillsides takes advantage of cross-winds as well as the cooling effects of a green roof. Half-buried, the residence – designed by Deca – is open and airy, inspired by the simple white color palette of classical Greek architecture even when it doesn’t borrow busy details like columns. 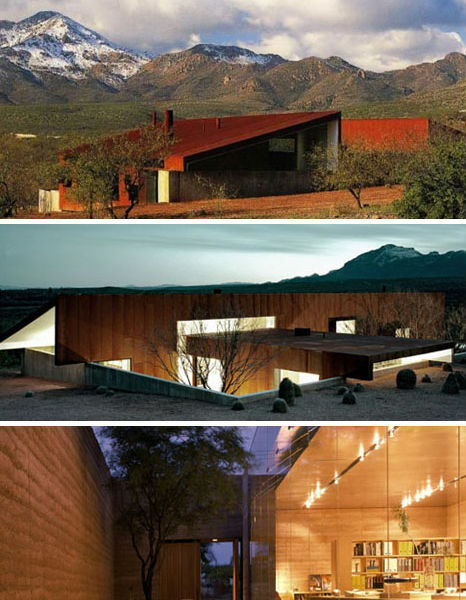 Varying volumes make this desert home by Pique visually engaging, especially with surface textures that include the requisite desert building material rammed earth as well as intentionally rusted metal and warm honeyed wood. All of these elements play off each other to present a cohesive whole that is simultaneously organic and geometric. 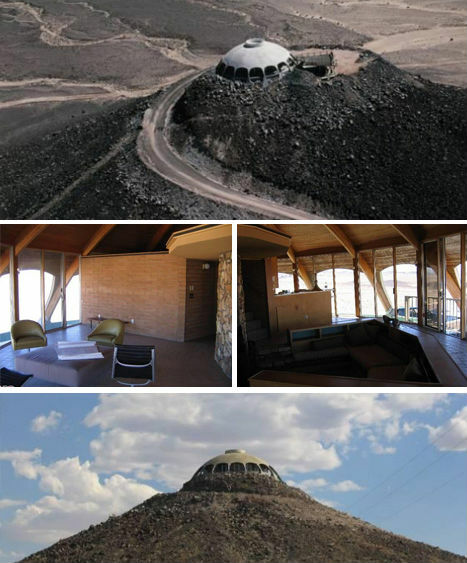 Perched atop a dormant volcanic dome like a crown – or perhaps a wayward UFO – this unusual home between Las Vegas and Los Angeles is still up for sale after a long time on the market. Though it looks like solid concrete from afar, it’s actually wood covered in a thin layer of plaster. The driveway that spirals from a shallow lake at the base of the volcano to the home at its pinnacle gives the property an even more dramatic appearance. 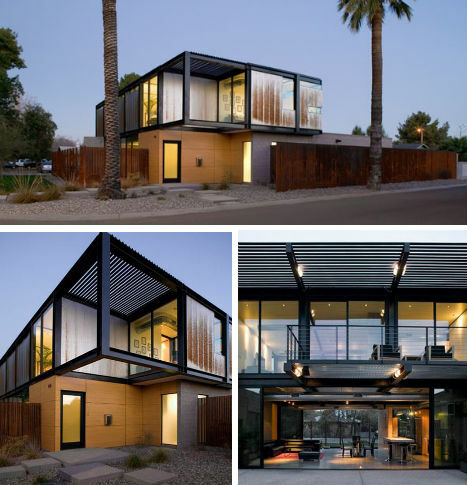 In the urban desert of Tempe, Arizona, the Sosnowski Residence by Chen + Suchart Studio combines earthy and industrial elements with a glass-and-metal rectangular volume stacked atop a rammed earth base. This neutral lower level makes the upper floor, with its bold black frame and steel-paneled ceilings, seem to float above the sand. There are few home sites more dramatic than the rocky cliffs of the Lefevre House, which acts as a conceptual bridge between the desert and the sea. 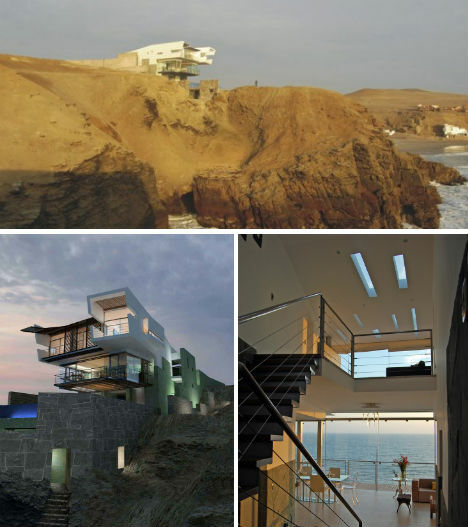 Located in Punta Misterio, Peru, the home’s roof is an extension of the sand while a glass volume juts out of the cliff, providing incredible views of the crashing waves below. 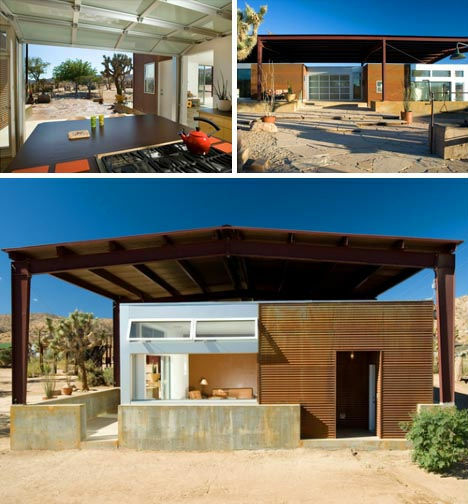 With its angled roof, made with copper mined locally in the Arizona desert, the Desert Wing House by Brent Kendle is dramatic and dynamic, seemingly ready to fly off into the sky at any moment. The solid rammed earth and concrete walls were designed to keep out the desert sun while walls of glass focus the views on nature rather than neighbors. 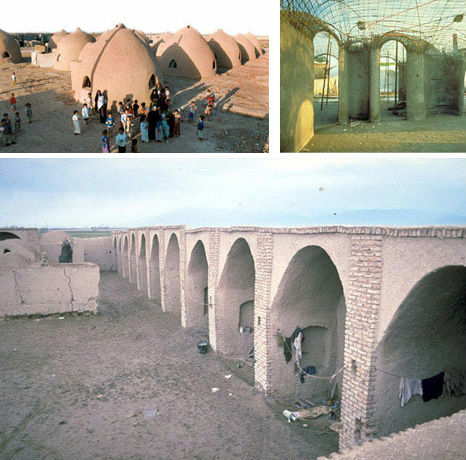 Taking a cue from ancient architecture that used local raw materials to create custom solutions for particular climates, architect Nader Khalili developed the Geltaftan System, building strong structures of mud bricks that are then fired for an entire day at 1,000 degrees Celsius – just like pottery. 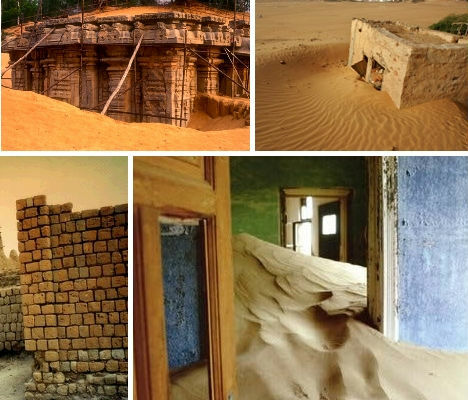 These ‘ceramic houses’ are permanent, water-resistant and earthquake-resistant with a finished result that blends seamlessly into the dunes of the surrounding landscape.